The human body normally reacts to this soft tissue trauma by “splinting” the injury with edema, a thin or watery fluid in tissue spaces or cell interstices. However, excess edema causes swelling that inhibits movement of the damaged tissue. These injuries result in two types of pain. The first is actual traumatic pain from the injury itself, and the second pain is from the swelling that results. LLLT focuses first on the lymphatic system which maintains the body’s fluid balance, while the laser light also helps absorb the excess edema. LLLT thus provides relief in two ways. MicroLight has FDA clearance for devices under both the “NHN” and “ILY” classifications.The MicroLight ML830® was cleared by the FDA for treatment of carpal tunnel syndrome. (See “About Us”). This clearance followed a double-blind study on CTS that was conducted at General Motors. Laser wavelengths between 820 nanometers (nm) and 840 nm have an extremely low absorption rates in human tissue. This means that laser light penetrates deeply at those frequencies. The ML830® is a GaAlA Laser that has wavelength of 830 nm with a power output of 90 mw. 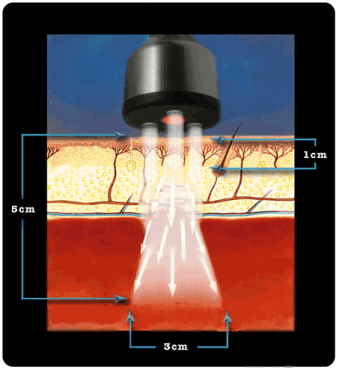 At this wavelength and power the ML830® Laser has a penetration of approximately 5 cm with a 3 cm lateral spread. It is not an accident that the Microlight Corporation of America chose & patented the 830nm technology for its ML830®. There are 30+ years of clinical studies that proved the 830nm range is the optimal wave-length. Our goal is to help you reach a Higher Level of Health and get better, faster. Reach out to us with one of the options below to experience Low Level Laser Therapy and other Revolutionary Treatment Techniques! Call us at 832-431-9908 to talk with us about Low Level Laser Therapy and any other solutions you might need.